Japan Sends Long Electric Whip Into Orbit, To Tame Space Junk : The Two-Way A cable that's as long as six football fields has been launched into orbit — and when it's deployed, it'll test an idea to knock out debris that threatens astronauts and spacecraft. 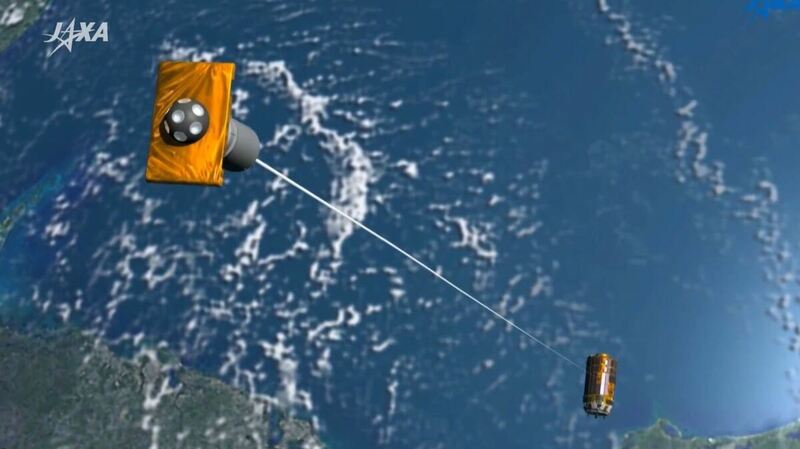 A rendering in a video by the Japan Aerospace Exploration Agency (JAXA) shows an electrodynamic tether being deployed to help reduce the amount of space junk in orbit. A cable that's as long as six football fields has been launched into orbit — and when it's deployed, it'll test an idea to knock out orbital debris. Japan's space agency sent the electrodynamic tether into space along with supplies for the International Space Station. Reels aboard the Japan Aerospace Exploration Agency's Kounotori 6 craft will deploy the 700-meter (2,296 feet) tether, essentially unspooling a clothesline in space that could help clean up the roughly 20,000 pieces of potentially hazardous space debris that are tracked by systems on Earth. With the official acronym of EDT (for electrodynamic tether), the Kounotori's cable "is a promising candidate to deorbit the debris objects at low cost," JAXA says. As illustrated by a video, the Japanese agency's plan is to use the electrified tether — counter-weighted by a 20 kilogram (44-pound) end mass — to slow down and redirect space junk into a safe but fiery reentry into the atmosphere. According to the video, the tether will be able to change its position relative to the Kounotori craft by the use of force that's generated by an electric current and the Earth's magnetic field. The video also depicts the tether being attached to a large piece of debris so the space trash can be guided down into a destructive reentry. Space debris has been seen as a problem for years — back in 2011, the National Research Council said the number of items had reached "tipping point" in terms of the dangers they posed to astronauts and spacecraft. As we reported last year, "According to the Royal Institution in London, there are about 20,000 pieces of tracked space debris, ranging from larger than an apple to as big as a school bus. (There are far more objects smaller than that, including millions of pieces of debris too tiny to track, according to NASA.)" There's a good chance we could see video of the new JAXA system being tested: Deployment of the tether will be monitored by cameras aboard the Kounotori. According to JAXA, the Kounotori is scheduled to dock at the International Space Station on Dec. 14; the tether won't be unleashed until the Kounotori leaves the space station bearing a new cargo of waste — with the entire craft destined to burn up on reentry.